Pesce al forno con patate, or baked fish with potatoes, is a popular dish among Roman restaurants. Although it is traditionally made with whole fish, this recipe uses fillets for simplicity. Fish cooks much more quickly than potatoes, so, following an older tradition of making pesce al forno con patate, this recipe calls for baking the potatoes first to make sure they cook all the way through and then adding the fish. Fish dishes are some of the most common and healthy in all of Italian cuisine. There are many people who are terrified of cooking fish, but you shouldn’t be—it is so easy and takes so little time to make a delicious and flavorful meal. This baked cod recipe is packed with protein, high in potassium, and low in carbs, and it takes only a few minutes to prepare. I paired it with some french green beans and hearty potatoes to round out this satisfying meal. Please always buy the freshest fish; you can substitute red snapper, tilapia, or haddock if cod is unavailable. This baked cod recipe is easy to follow and quick to make. You can substitute it with tilapia or other white fishes. Line 2 baking trays with parchment paper. Put the halved potatoes in a bowl with 2 tablespoons of the oil and toss to coat. Add salt and pepper to taste and toss again. Spread out the potatoes on one of the baking trays. Bake for 30 minutes or until tender and browned at the edges, turning them over halfway through. Brush the fish fillets on both sides with the remaining 2 tablespoons of oil and sprinkle both sides evenly with salt and pepper. Transfer to the other baking tray and bake for 10 minutes or until the fish flakes easily. Carefully transfer the cod to the potato tray and add the green beans, garlic, and lemon juice. Drizzle with a little olive oil. Transfer back to the oven and bake for an additional 10 minutes. 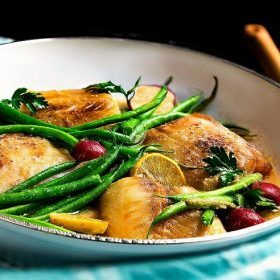 The post Baked Cod Recipe with Green Beans and Potatoes appeared first on Authentic Italian Recipes.